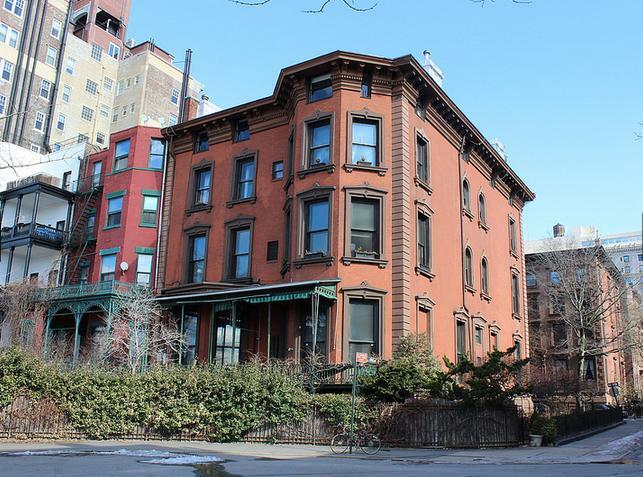 Brooklyn Heights – Where Dreams Are Made? | John Reinhard Dizon's "Transplant"!!! In Chapter One we follow the Four Doctors to Adam Rauch’s brownstone on Grace Court at the Promenade in Brooklyn Heights. It provides residents and visitors with a breathtaking view of the Manhattan skyline, arguably one of the most beautiful places on the planet. Rauch and his friends’ parents bought the homes back in the day, when they sold for a million dollars. Now this apartment is listed at $1.8 million dollars. Just the one apartment. How times change. We remember the Patty Duke Show of the Sixties which made the Heights famous. In the Seventies, the horror flick The Sentinel was filmed at 10 Montague Terrace (see photo). That’s when they really started upping the ante in this real estate area. To add insult to injury, this is listed as a one-bedroom apartment. The narrative speaks of how the four friends would hang out under the Brooklyn Bridge at night, admiring the view and dreaming of their future success. It was an autobiographical touch by JRD, who spent his own childhood fantasizing about his own slice of the Big Apple while gazing at the Statue of Liberty, the World Trade Center, the Empire State Building, and dozens of other landmarks. This entry was posted in Suspense/Thriller and tagged Adam Rauch, Brooklyn Heights, John Reinhard Dizon, Transplant. Bookmark the permalink. ← Manitoba’s is *The* Place to Go in “Transplant”!! !